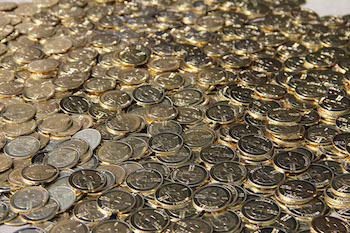 The government's problem with creating a physical version of digital currency? It's the same thing as making actual currency. Michael Caldwell had a pretty cool idea: He wanted to make a physical Bitcoin so people could actually hold their virtual wealth in the palms of their hands. Seems like a simple thing to make, right? Unfortunately, the U.S. government doesn't think that's so: The Treasury Department has stepped in and forced Caldwell to stop making his shiny e-money, at least for the time being. It's that last part that caught the Treasury department's attention. By creating pieces of physical currency with an designated monetary value, Casascius is technically considered a "money transmitter business," a type of company that is regulated by the federal government and 47 out of 50 states. So, while Caldwell's coins aren't illegal, he will need to receive a federal license to continue making them. He might also need to apply for individual licenses at the state level. It would be a very long, expensive process. Regardless of what Caldwell decides what to do, Casascius is closing its doors for now.